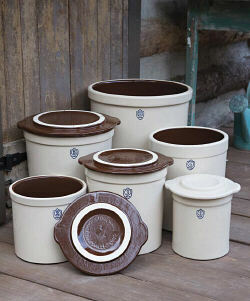 These Stoneware Preserving Covers are made to fit our Ohio Stoneware 1,2,3,4 and 5 gallon crocks and to protect the food during the fermentation process and any food stored inside the crocks in the kitchen or pantry. These covers may also fit crocks from other manufacturers. Verify measurements before ordering. *measurements can vary due to 1 inch to 2 inch due to being hand made. 1 Gallon Cover - Outside Diameter 8-3/4", Inside Diameter 5-1/2", Height 1 1/2"
2 Gallon Cover - Outside Diameter 11", Inside Diameter 7-1/2", Height 1 1/2"
3 Gallon Cover - Outside Diameter 12", Inside Diameter 8-3/4 ", Height 1 1/2"
4 Gallon Cover - Outside Diameter 12-1/2", Inside Diameter 9-1/4", Height 1 1/2"
5 Gallon Cover - Outside Diameter 13-3/4", Inside Diameter 10-1/2", Height 1 3/4"
10 Gallon Cover - Outside Diameter 17-1/4", Inside Diameter 13", Height 2"